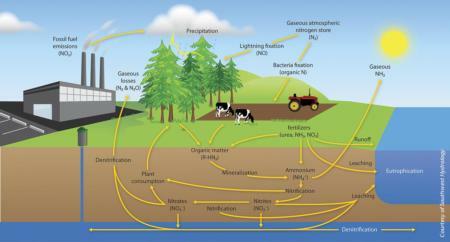 The terrestrial nitrogen cycle. Courtesy of Southwest Hydrology. The nitrogen cycle is a complex web of natural and industrial processes that converts nitrogen into many different chemical forms. Understanding the nitrogen cycle is important when considering how to create a nitrogen budget. Nitrogen fertilizers (organic or mineral) are an irreplaceable part of agricultural production. However, when nitrogen is added to an agricultural system, it becomes subject to all of the transformations contained within the nitrogen cycle. When all of the nitrogen applied to agricultural fields is not taken up by crops, the excess reactive N can cause environmental problems, including groundwater nitrate contamination and emissions of nitrous oxide, a potent greenhouse gas. An increased understanding of the factors that will affect transformations of nitrogen allows for better management of this important nutrient. For an in-depth discussion of the terrestrial nitrogen cycle, click here or for an agriculturally-specific discussion of nitrogen dynamics, click here. The many processes involved in the nitrogen cycle result in many forms of nitrogen in the environment that are able to undergo transformations. Harnessing these transformations can increase nitrogen use efficiency, results in reduced costs and reduced environmental effects. In order to help harness these transformations, the sources of nitrogen are reviewed here. Residual Nitrogen: Applied nitrogen in excess of crop demand can represent a substantial amount of plant-available nitrogen that is unaccounted for. Accounting for this carryover nitrogen can translate into savings in the form of fertilizer reductions. Nitrogen from Organic Sources: During a growing season, organic nitrogen sources, such as soil organic matter or incorporated cover crops, can be broken down to supply a crop with nitrogen. Nitrogen in Irrigation Water: Irrigation water, especially if it is coming from groundwater, can have substantial amounts of plant-available nitrogen in it. Accounting for this nitrogen can help with nitrogen budgeting. Fertilizer Nitrogen: There are many factors to consider when choosing nitrogen fertilizers. To help with analyzing these factors, consider the four Rs of nutrient management: Right form, Right rate, Right time, and Right place. The categories of nitrogen sources here are intended to roughly reflect proposed nitrogen management plans and to help integrate these sections into informed management decisions. Templates for nitrogen management plans can be found here for the Central Valley Regional Water Quality Control Board and for the East San Joaquin Water Quality Coalition. One tool developed by UCANR (in conjunction with CDFA and FREP) to integrate irrigation and fertilization is Crop Manage. This is a web-based, database-driven tool that assists growers and farm managers in determining water and nitrogen fertilizer applications on a field-by-field basis. The software automates steps required to calculate crop water needs and estimates fertilizer N needs for lettuce and other crops. The web application also helps growers track irrigation schedules and nitrogen fertilizer applications on multiple fields and allows users from the same farming operations to view and share data. More crops are being added as the program is developed.